Register Log In ECN Forum Forums Photos for General Discussion Service Change: I got lucky! A 1959 home was recently bought by an investor, with the intent to remodel and rent out. One thing he wanted was to replace the old fuse box with breakers. That tan thing set in the wall is the kitchen exhaust fan. Last edited by renosteinke; 06/29/09 12:49 PM. Darn it! They WERE there! I'll re-post. Wow, that indoor panel was outdoors for fifty years without failure? That's pretty impressive in my book. 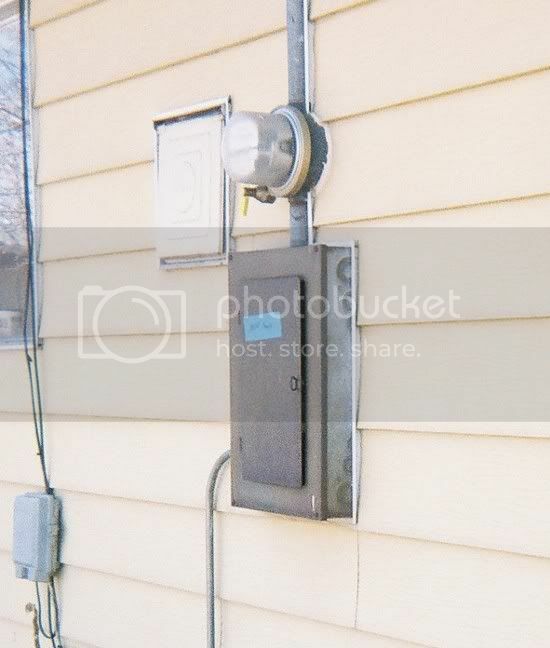 What are they going to do about that hole in the siding where the old meter socket was? That looks like a haven for bees if it remains open like that. Just as a comment, I would have probably figured out a way to get rid of that 1/2" EMT on the left or at least rework it so it comes up into the bottom of the panel. You are right: The chances of finding an all-in-one that fits the existing hole nearly perfectly is probably a once in a lifetime accomplishment. First, I do not think there even was such a thing as an 'outdoor enclosure' in 1959. I believe the NEMA designations came about in the early 70's ... and I do know we were well into the 80's before UL recognized them (UL had their own criteria until then). Also note the mild corrosion. Panels of that time were often just painted; only recently have they been required to be galvanized as well as painted. The 1/2" EMT to the right posed another problem: swollen insulation. That is, the cloth/rubber wire insulation had swollen with time, and it wasn't about to come out of that pipe. So, I simply made it fit the panel as best I could; that's why it's a bit off-plumb. 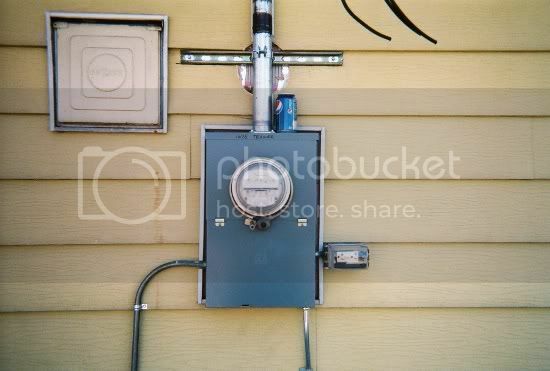 As for the siding, the property owner (and HVAC contractor) claimed he would patch / seal the old meter opening. As there was a siding crew working (literally) next door at the time, I would not be surprised if he conned them out of a scrap piece or two. This job, like most, had plenty of other little 'quirks.' It was particularly of concern to me because it was my first service change, first permit pulled, since I "went solo." I had done work for the customer before, but never on my own, and he was a bit nervous. Meanwhile, the city has laid off its' entire building department, and the inspections were carried out by parks department employees (oh joy!). The PoCo, having just undergone a re-orginization, had also made some major changes in how these service changes were to be done. Being a east coast guy...is that an 'all-in-one'? Meter and branch breakers? BTW: Yes, luck was on your side, nice!!! I have seen a good number of rain tight Cutler-Hammer XO meter/dist panels(meter socket & 12 circuit main lug panel in one) of 1958 or earlier vintage as locally there were subdivisions full of them & a lot of them are still in service. Hotline, yes, that is an "all-in-one." The lower compartment contains both the main breaker, as well as the branch circuit brealers. A more common design is split vertically, with the meter on one side and the breakers on the other. The house I grew up in had breakers in 1954 (old SqD) but that may have had to do with the GI bill. There were lots of things a "GI' house was supposed to have. (they may have only been inspected around DC tho) We had the 3 wire Romex too but with the downsized neutral.